Documentary: "The Making Of '20,000 Leagues Under The Sea'"
These days, you can release a DVD with a five-photo gallery, two text screens of production notes and a commentary track by the film's caterer's poolboy and call it a "Special Edition." If you want to see what a "Special Edition" DVD SHOULD BE, check out Disney's newest release "20,000 Leagues Under the Sea: Special Edition." Wow! "20,000 Leagues Under the Sea" was the first movie I ever saw in the theater. My dad took my brother Vic and I to the Loew's State theater in downtown Memphis. The year was 1962 and Memphis still had a number of ornate movie palaces in existence. 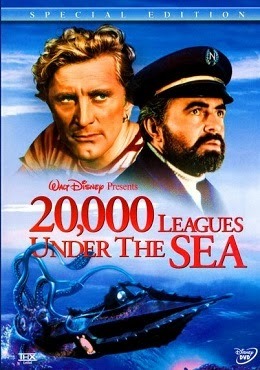 "20,000 Leagues Under the Sea" remains the grandest live-action adventure film from the Walt Disney Studio. The 1954 film has lost none of its excitement or charm after nearly 50 years. "20,000 Leagues Under the Sea" boasts excellent performances, a great script, top-notch direction and outstanding special effects. Based on the novel by Jules Verne, "20,000 Leagues Under the Sea" tells the story of a hunt for a sea monster wreaking havoc in the pacific ocean. Turns out that there is no sea monster. Instead, the anti-war activist of his day Captain Nemo (James Mason) leads his crew of submariners aboard his nuclear submarine The Nautilus on a campaign to sink war ships of any flag or nation. "20,000 Leagues Under the Sea" stars an all-star cast. James Mason turns in an intense performance as the twisted and troubled Captain Nemo. Star Kirk Douglas is Ned Land, a harpooner who represents the common man. Paul Lucas (Oscar winner for Watch on the Rhine) stars as Professor Arronax, the French biologist who represents the voice of scientific reason. The great Peter Lorre provides comic relief as the cowardly assistant to Arronax. "20,000 Leagues Under the Sea" is full of memorable set pieces. The most famous scene is the battle with the giant squid. The film won the Oscar (deservedly so) for Best Special Effects. The miniature models were created by Marcel Delgado, the assistant of "King Kong" creator Willis O'Brien. Richard Fleischer's direction is impeccable. The Art Direction and Set Design also won an Oscar. Captain Nemo's submarine is still one of the most detailed and authentic fantasy vehicles ever developed for the movies. Great movie, picture, sound and extras. A must have DVD! Disney remastered and restored "20,000 Leagues Under the Sea" for this DVD. The picture is remarkable. The deep, rich Technicolor images hearken back to a type of movie making that doesn't exist anymore. The colors are well saturated, vivid and well delineated. Sharp image throughout the entire frame. Excellent flesh tones. No shimmering or pixilation. Even the extras look great! From Paul Smith's hit-or-miss score to Kirk Douglas's fun song "A Whale of a Tale" to the myriad other sound effects in this movie, the sound is outstanding. The 5.1 Dolby Digital track captures all of the ambient sounds of this classic film. Deep, rich tones which are well balanced flow from your home theater system. This DVD is loaded with some of the best extras I've ever seen or heard. The commentary track by director Fleischer and film historian Rudy Behlmer contains a ton of great information and insights into this classic Disney film. The feature length documentary "The Making of '20,000 Leagues Under the Sea' is one of the best 'Making Of' documentaries I've ever seen. The 80-minute film contains footage long thought lost which was shot as the movie was produced. This archived footage (which looks great!) is intercut with new interviews with surviving cast and crewmembers including Kirk Douglas and director Richard Fleischer. This documentary is worth the cost of admission alone. Of course, Disney doesn't stop with just this one great extra. This two-disk set contains a whole lot more. The Squid Attack was filmed differently to begin with. In the original sequence, the attack took place at sunset in calm seas. For obvious reasons, the scene was refilmed. It just didn't work. The original 35mm negatives of the "Sunset Squid" sequence were destroyed. A 16mm print was recently found, restored and mixed with the original score for this DVD. It is interesting in that it shows the mechanical beast in more detail. The scene doesn't work as originally shot and Disney wisely spent the extra money to reshoot the scene. There is a montage of alternate takes that lasts for several minutes. Nothing special. The storyboard to film comparisons are quite good. The original storyboards were very detailed. This section includes the "squid attack" scene. There are a number of galleries, which include many excellent photos. The bio section is also quite detailed. As a memorabilia fan, I enjoyed the "Movie Merchandise" featurette, which includes an interview with two collectors of just about anything you can imagine from the movie. There is a lot more to discover on this disk. I'll leave it to you to do just that. A treasure pure and simple. A classic film given the royal treatment is so richly deserves. If you've never seen "20,000 Leagues Under the Sea" this is the best way to see it short of on the big screen. A must have for anyone's permanent DVD library.